What the Single-Leg Squat lacks in glamor, it makes up for in challenge. It’s one of the hardest exercises to get right, but it pays off big in improved strength and balance. The ability to Squat and Deadlift with two legs is important to your athletic development, but sports also require you to spend a lot of time going from one leg to the other. Single-leg work helps you increase control and strength in your legs. Incorporating single-leg exercises into your training improves your ability to spend time on each leg on its own. Single-leg work also helps prevent injuries caused by depending on one side more than the other for stability (think groin pulls and knee pain from knees caving in). There are two approaches to a Single Leg Squat: with bone-on-bone support of the hip and overall strength; and with hip stabilizers, trunk control and overall strength. It is important to recognize the difference between the two. In the first photo, I am using bone-on-bone stability to perform the Single Leg Squat. In the second, I am using my trunk stabilizers and hip muscle to stabilize and perform the Squat. In case you are wondering, you want to be more like Photo 2 than Photo 1. I want you to comfortably be able to get into both hips and stabilize equally on both legs. 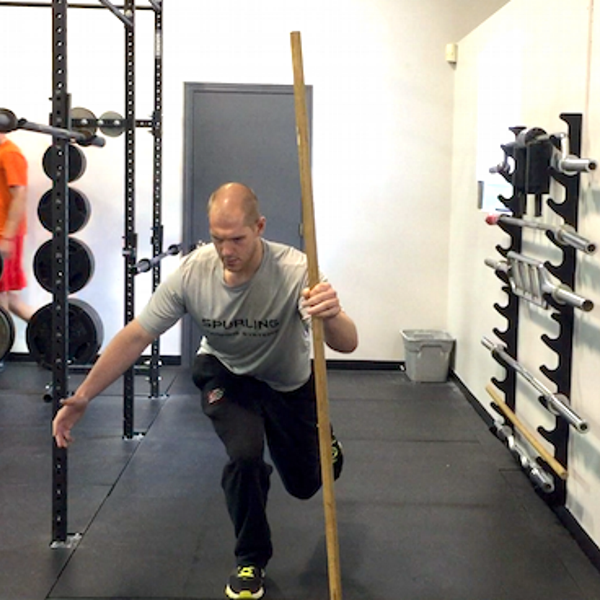 Start with the most stable exercises, move on to less stable ones and finish by adding a dynamic/ballistic component. If you look at the Lateral Lunge the way I do, like a nerd, it’s very similar to a Single Leg Squat. You learn to sit back into each hip and stabilize most of your weight on one leg. The other leg is more like a kickstand on a bike. The Lateral Lunge has a handful of variations, but the one that most closely mimics the Single Leg Squat is the Valslide/Slideboard Lateral Lunge. In this variation, you sit back into your hip—unlike a traditional Lateral Lunge, where you step into the hip—a subtle but important difference. There is a plethora of assisted variations, but I am giving you what in my opinion is the best—the Single Leg Squat with Dowel. The reason I like it is because it does not make you rely on sitting back to a box. That’s a good alternative, but learning to stabilize without a box will help you more in the long run. The goal is to be able to sit back more and more into that leg over time. Start with the range you can control and gradually go a little deeper. Eventually you will not need to rely on a dowel for support. The last progression is single leg squatting off a box. This is the last step before single leg squatting. You will find this a little easier, since in some ways it’s more like a Step-Down than a Squat. Keep in mind that you need to keep your weight back in the hip and not shift all your weight to the toes. What’s the point of putting all this work in if you can’t translate it to real life? Heidens are a great drill that build off the above exercises. Heidens encompass all that we are trying to accomplish: getting into both hips, stabilizing at the knee, and being able to translate all of that into an explosive pushoff. Now that you know where to start, get out there and do it. Try putting one of these drills at the end of a leg day as an accessory movement.